While Hunter worked on our church’s youth group lunch stand on Saturday at a local auction sale, Miss E and I decided to take a look around for treasures. The auction sale was our friends and local church goers as they down size and empty a house full of family heirlooms and belongings. E, of course had a baby doll along with her and quickly found a home for it. She wanted this baby crib and said her daddy could fix it. It was time to get a bidding number to see if we could win the baby crib for Miss E.
The concept behind an auction was new to E. “I want it” did not equal she could have it. Patience came into play. Not something I have much of and certainly not something she has any of either. We had to pass the time to wait for our chance to bid as they went around the room selling boxes and boxes of stuff. 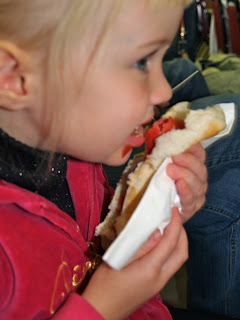 Miss E kept her brother busy waiting on her at the lunch stand eating a Sloppy Joe, a (red…it’s a German prairie thing) hotdog, a snack size bag of Cheetos, a homemade chocolate chip bar and two soda pops, totaling more junk food than she normally is allotted in one month’s time. In the midst of trying to pass the time to bid on the baby crib, we spotted a few more treasures. Have you ever seen a more fabulous Capiz shell chandelier/ lamp? I had not and immediately loved it. But I knew someone would love it even more than me, texting a picture of it to my sister to let her I would be purchasing this hopefully for her. She was giddy. Then I realized I maybe should not have gotten her too excited. What if I couldn’t pull through and be the winning bidder? I brainstormed on how much I would pay for a birthday gift combined with her Christmas gift. What was my maximum to bid? I couldn’t figure out my limit. But tried to keep saying to myself that $50 was my limit to bid on anything. The auction was held inside our American Legion due to the frigid temperatures the day and evening before. The day itself turned out sunny and pleasant but it was much easier to manage a two year old inside the Legion. I resisted purchasing too many things. I love old dishes, books, art and collectibles but recognize prairie auction sale treasure may consume my home all too quickly. In the end we came home thrilled with our few treasures. My little bidder got her baby crib for $3 and a cute painted shelf for her room for $2. 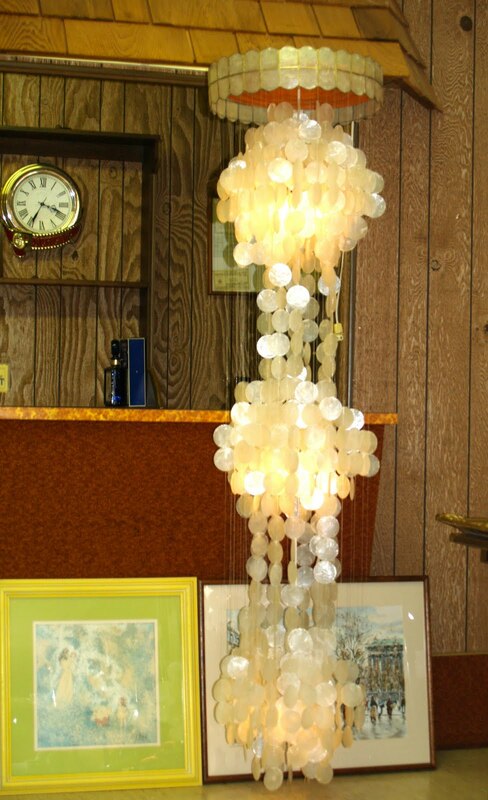 The Capiz shell hanging lamp? I thought $50 at least…but I would have gone to $150. They are trendy and hot right now and could have gone for 10x that in a major city I figured. Merry Christmas and Happy Birthday to my sister! I cannot wait to see it in her house. Also for $10 I purchased this mirror. It says December 25, 1971 on the back of it. I assume it was a gift Miss Jean received that day. I am going to paint it and put it in Anika’s room. Should it be red or white? Two more prairie auction treasures were a pottery bowl that matches a set I already have and a 2 gallon Red Wing crock. I did not pay more than $25 for any item I purchased which was even more fun in our treasure hunting. Miss E’s need for a nap ended our prairie treasure hunting but we went home happy with new to us treasures. It also was fulfilling to be there with local friends supporting this family sale. It was Miss E’s first prairie treasuring hunting auction sale and certainly will not be our last together. There are certainly more doll cribs, doll houses, crocks and dishes among other treasures left for us to uncover at future auctions on the prairie. What’s your favorite treasure/ bargain? Katie–I’m so glad to know some of our family treasures will be loved by you, Elizabeth, and your sister!! Enjoy! !